See those octagonal elements on the floor? They have a shape that is almost identical to the back of an X-wing fighter. *Almost* identical. Because is that really an X-wing fighter in the background? In McQuarrie’s original design, the engines split in half when the wings split into attack position. This blue-grey panel next to the Millennium Falcon under construction looks exactly like the back panel of the control station from which Han Solo once warned Threepio to never upset a Wookiee. The mysterious smoke on the set in Abu Dhabi is eerily similar to the smoke rising from the Beru homestead after it was destroyed by the Empire. This sign, on the broken fence around the market set in Abu Dhabi, says “Warning” in Aurebesh. Probably because it was once electrified. The big engine on the set of Abu Dhabi might have once been used in the famous pod races on Tatooine. 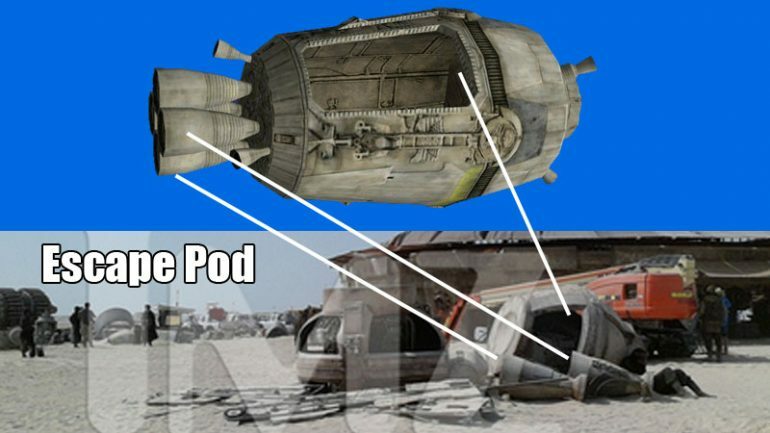 What looks like random junk in the sand might actually be a broken escape pod! You can see the open hatch and the propulsion engines beside it. The impressive gate at the entrance of the market set comes straight from Ralph McQuarrie’s paintings of Jabba the Hutt’s palace! Two circular objects in the sand look very much like smaller versions of the shield generators we saw on Hoth. Perhaps they were once used to generate the power for the electric fence around the Hutt palace. Want to discover even more hidden details? Listen to our detailed analysis of all the spy pictures in the newest episode of our show “Secrets of Star Wars”! Click on these links to subscribe to the podcast: Subscribe to the feed | Subscribe with iTunes. And be sure to follow us on Twitter and on Facebook for the latest news and for updates of the podcast! Have I missed any important details? Can’t wait to hear what you have discovered in the TMZ photos. Let me know in the comments! Last pic looks more like half buried pod racer engines. Rock on! The unsplit X-wing could be the Z-96 Headhunter. They’re very similar in design, except it doesn’t have a split wing formation. Practial effects, actual sets and props. I can’t think of any better way to pay homage to Ralph McQuarrie and every person responsible for the look of Star Wars ……I mean to make Star Wars look like, Star Wars. I feel like a kid again………. “Grow up. These are my movies, not yours.” – George Lucas. I don’t really think these set pieces are enough evidence to deduce what the look of the film will be. The prequels used more models, props and sets than the original trilogy but had it’s own look and feel based off of how they were going to visualize the story. There’s a ton of stuff that people think are all cgi in the prequels that are in fact actual models and sets, just enhanced. I’m pretty sure Ep. 7 will be 100% Star Wars but it will also have it’s own unique feel and more than it’s fair share of enhancements as well. And by evidence and look I meant overall look as in enhancements. And I agree with you, major props to them paying homage especially without Ralph M. here to see it. I agree, CGI will be used, and I did not know that about the prequels….to me the settings in them seem too big and busy……the shots and settings in the OT are simple, but seem to draw me in and make me feel like I’m there instead of watching a movie…….if that makes any sense. I guess it’s like seeing your favorite band in a huge arena with all the bells and whistles vs a small intimate venue with just the band, you’re seeing the same band but it just feels more personal. With Abrams being a fan of Star Wars, I feel he will try to emulate the atmosphere of the OT but create its own feel at the same time. I think Super 8 is a good example of how Abrams can make a new movie feel old, while still using new technology. Awesome,gonna follow this site from now on and spred the work on twitter. Saw a clip on youtube of Mark Hammill at the Star Wars Weekend of the Joker talking to Luke Skywalker…..looked like he had a beard, could Abrams be going for a Obi Wan look for Luke?